Technology has made tracking physical activity and food intake so easy, there’s no excuse not to do it when you have an easy-to-use app right on your smartphone. HealthCentral reviewed many of the apps on the market. Here’s a wrap-up of the best ones out there you can use to help you achieve your nutrition and fitness goals. This app enables you to use the built-in GPS in your phone to track all of your fitness activities. MapMyFitness records all the details of your workout, including distance, duration, speed, pace, route, elevation, and calories burned; all you have to do first is complete a brief personal profile. It also has an interactive map that can help you plan your workout and see other people’s routes. 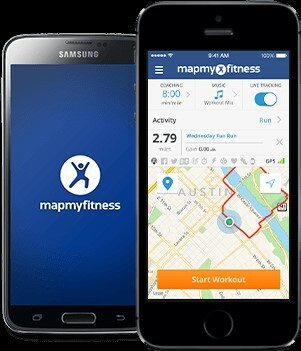 There are variations of this app based on your workout interests: MapMyRun, MapMyHike, MapMyWalk, and MapMyRide (for cyclists). Why we like it: With a simple press of the “Start workout” button, you can track all of your activities with ease. MapMyFitness sends you motivational emails each week, month, and year to show you the cumulative progress of your workouts. It’s a great way to track the pace of each mile completed as well as your average pace during your entire workout. The voice prompts at each mile are great motivators to keep moving. This app isn’t just about fitness: It also helps you track your food intake and hydration to help you meet your health goals. 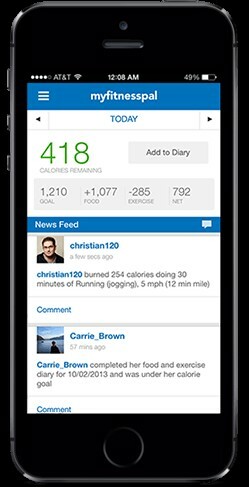 By completing a simple profile, you can set any weight-loss goals (including how many pounds you’d like to lose each week) and MyFitnessPal will help you stay on track with daily and weekly motivational support. The food database contains over two-million items, making it easy to find and tap the ones you’ve eaten for your daily log—no need to write out a detailed food journal! Why we like it: This is a great app for monitoring both food consumption and physical activity. If you’re looking to lose weight, it enables you to develop a personalized diet profile based on your unique needs. You can also add your own recipes to the database. If you wear a fitness tracker (such as a Garmin Connect), you can sync your workouts to the app with the press of a button. If you’re looking to lose weight and want a simple way to track your food intake, this is the app for you. After you set up a brief profile, which includes your goal weight, Lose It! calculates a personalized plan for you, including a daily caloric allotment and a countdown to the number of days ahead of you to meet your goal. You can easily track your food intake and exercise using a searchable database. Lose It! comes with a barcode scanner to help you track your intake of packaged foods. It only takes seconds to log a meal, so keeping a food journal is a breeze. Why we like it: Like MyFitnessPal, Lose It! can connect to a variety of wireless devices and fitness trackers so you can sync them all. If you dread the thought of keeping a food diary, the barcode scanner does all of the work for you. Lose It! also has a great online community that you can reach out to if you need support or advice. Lose It! provides you with motivation along the way, including texts that congratulate you as you move closer to your goal. Multiple research studies have shown that tracking diet, exercise, and weight are a huge component of weight-loss success. Thanks to technology, these diet and fitness tracking apps have made self-monitoring easier than ever. 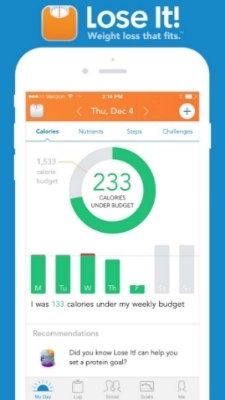 Consider trying one of these free apps to help you set a goal and stick to it. Any of the above fitness and nutrition apps can be helpful when you have a chronic illness; for instance, Leslie Rott, who lives with rheumatoid arthritis and lupus, uses activity trackers to help her monitor her diseases. There’s a fitness tracker that women wear inside their bodies to help with incontinence. And there are apps that help you manage sleep disorders — which, let’s face it, affect all chronic illnesses.